Paradigm Gallery is pleased to present "Sacred Lands", an exhibition of new sculptural works by the artist Drew Leshko, opening March 23, 2018 and remaining on view through May 19, 2018. The exhibition's title is a reference to Leshko's Philadelphia neighborhood of Fishtown, and its ancestral roots as the home to the indigenous Lenni-Lenape. For more than a decade, Leshko painstakingly documented the rapid re-development occurring in his hometown of Philadelphia, specifically the historical neighborhood of Fishtown. Although Leshko's works are sculptural by nature, he largely considers himself a documentarian, his sculptures echoing the work of legendary documentary photographers Gordon Parks and Bernd and Hilla Becher. As the forces of gentrification radically transform his neighborhood, Leshko's three-dimensional hyper-detailed sculptures serve as an all-too-necessary archive of the past. Highlighting decaying establishments in a transitional period (often not long before they are repurposed or razed), Leshko's paper and wood recreations act as artifacts of a bygone era, of a disappearing America. Leshko is particularly attracted to overlooked and oft-neglected sites, the unremarkable buildings which will not be preserved. With past works, Leshko's been drawn to the once-thriving churches that have closed their doors as parishioners have been forced to relocate, and the small local businesses with their classical designs which are now juxtaposed with modern slapdash renovations, as well as the facades and machines of yesteryear. His models splendidly isolate anachronistic architecture, encouraging the viewer to consider history through a unique prism. For "Sacred Lands", Leshko replicates the Kensington Soup Society, a soup kitchen which opened in 1844 and closed in 2008; Penn Treaty Metals, a metal recycling business spanning three generations, the name of which references William Penn's Treaty with the Native Lenape in 1683; and the Edward Corner Marine Merchandise Warehouse, with its hand-painted signs providing a physical reminder of Fishtown's waterfront history. Leshko's sculptures will be complemented by his small-scale reproductions of local signage (for bars, restaurants, VFW halls, and even strip clubs), as well as vintage photographs of historical buildings courtesy of the Philadelphia City Archives. Leshko's 1:12 dollhouse scale replicas are meticulously crafted, requiring 120 to 160 studio hours to create. He begins each sculpture working from a single photograph as an image reference, but then will discard the photograph in mid-process, relying on memory to complete the piece. His miniatures act as singular physical documents of the buildings and businesses which are sadly proving unsustainable. Leshko's ongoing examination of gentrification and historical preservation (or lack thereof), asks the timely question "in a soon-to-be-forgotten America, what is worth preserving?". Drew Leshko is a Philadelphia, Pennsylvania-based artist. 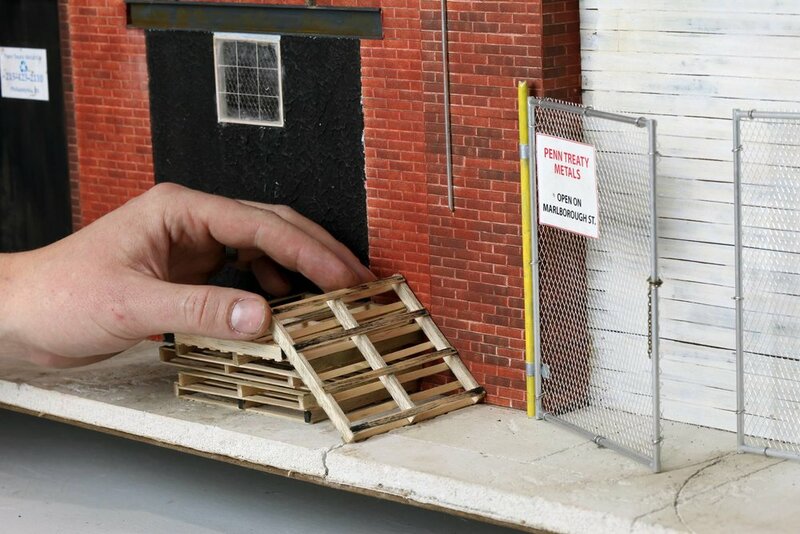 Working from observation and photographs, the artist painstakingly recreates everything from building facades to campers at a scale which may be familiar to some viewers as standard dollhouse spec; the treatment to Leshko's work is widely different. The minute detail of his work includes city detritus such as dumpsters and pallets, which are commentary of the ideas of what is worth preserving. Accumulations of typically overlooked details and minutiae like acid rain deposits and rust become beautiful adornments. Leshko’s work has been exhibited in galleries, and museums both nationally and internationally. His work is included in permanent collections including the Dean Collection (NYC), West Collection (Philadelphia), Iron State Development’s corporate collection (Hoboken), Urban Nation Museum (Berlin), and many private collections throughout the world. Established February 2010, Paradigm Gallery + Studio started as a project between cofounders and curators, Jason Chen and Sara McCorriston, to create a space to make artwork, exhibit the work of their peers, and invite the members of the local community to make their own artwork in a welcoming gallery setting. Over the years, Paradigm Gallery + Studio has become a gallery of diverse contemporary artwork from around the world, while maintaining a focus on Philadelphia artists. Gallerists and artist are available for comment or other media requests. Please contact madison@aopublic.com.